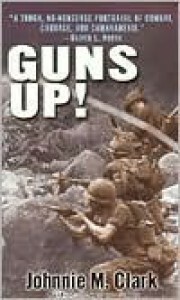 Recommended as "one of the top Vietnam War memoirs" (I think actually by a UK newspaper, possibly by a UK war writer), GUNS UP! is a sort of full-blooded, full-throated war memoir that follows a Marine ranker and his best friend, Andrew Chan, a Chinese-American, who are both machine gun operators and summoned by the call "Guns up!" when their platoon makes contact. It's an odd feeling, dealing with war classics. You know on the one hand that posterity has declared this to be a memoir classic, but the enormity of 60,000 US dead and 3 million Vietnamese just seems so tragic. Would PH and Thailand have gone red had the US not fought in Nam? So declare some military writers. But I'm not sure. Well, putting aside politics, this is a full-blooded war memoir. Filled with combat, filled with the buddy relationship, and packed with period detail. Oh and Chan is a devout Christian, so there's plenty of biblical quotation too.